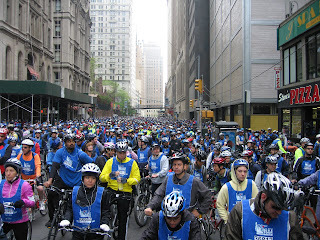 Today I signed up for the Five Boro Bike Tour, held in New York City on the first Sunday of the month of May every year. Registration is limited to the first 30,000 cyclists. This will probably be the largest gathering I will have been part of, on any occasion. The ride consists of a 42 mile loop that starts at the Battery Park in Lower Manhattan and takes the riders through all five boroughs of New York City. The only catch is that on the previous day I will be riding a 300km brevet in Pennsylvania. The Boro will serve as a recovery ride. I think it will be amazing! I highly encourage you to take part if you can. By the way, the roads along the route will be closed to automobile traffic.